Discourses On Islamic Way of Life by Justice Mufti Muhammad Taqi Usmani. Translated by Iqbal Hussain Ansari. The English version of the Islahi Khutbat, has been published by Darul Isha’at Pakistan. This is solely because of the Favours of Allah on us and the prayers of our mentors. This is the translation of the reformative speeches of Mufti Justice Maulana Muhammad Taqi Usmani may Allah prolong his benefits over us. He has been given these lectures for about ten years every week at the Bait ul Mukarram Masjid, Karachi. Those who attend these lectures gain much knowledge theoretically and practically. I, too, attend these lectures and have been deriving much advantage. These lectures are being recorded on audio cassettes and books are published subsequently. These cassettes and books cater to those who understand the Urdu language. We at Darul Isha’at desired that an increased number of people should benefit from these lectures. Allah helped us get these books translated into English and publish them and He also provided us the necessary means. Al-Hamdu-lil-laah, after six years of continuous effort a complete set of these books is available to the readers. Let our readers remember that these books have been translated from oral lectures of the honourable Mufti Justice Maulana Muhammad Taqi Usmani and not from his writings. They may, therefore, find in them the style of the spoken words that the translator may have retained here and there. We have endeavoured to match the get up of the books with their invaluable content and have paid due care in the use of paper, printing and binding. We hope that this set of books will be very useful to our readers in Europe and the United States. They will gain beneficial knowledge from these books and be prompted to put their knowledge into practice. Insha Allah they will find a great change in their everyday life. 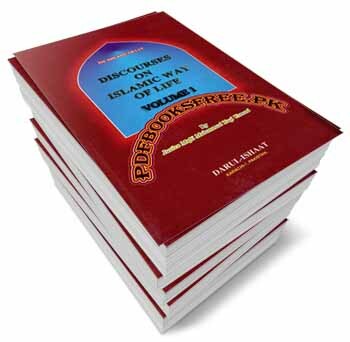 Complete 10 volumes of Discourses On Islamic Way of Life book is now available here on Pakistan virtual library in high quality Pdf document for the study of readers. Check out the following links to read online or download the complete book in Pdf format and enjoy offline reading in your computer and android devices.